Childhood memories remain with us all our life. When stoked, they sprout forth like a fountain drenching and flooding you, and you love to drown yourself and getting lost in the beautiful past. My mother did a course on fruit preservation. But it was my dad who actually took to trying out every jam, jelly and toffee that my mom learned in her sessions. As kids we loved to flip through the pages of mom’s notebook that had pictures of fruits and products prepared with them. We could imagine the taste of the goodies shown in the notebook. Having our own orchard with a variety of fruit trees gave a fillip to making jams at home and my father gained expertise in making jams of all kinds and all those who got to taste them admired his dexterity in combining different fruits and coming come out with unique flavors. Taking a leaf from my past, I went ahead to make Guava Cheese from the pulp left after making Guava Jelly. In the initial stages of cooking the cheese will bubble, jump and spray your cook top and surroundings. As it thickens, it will bubble occasionally and needs constant stirring. The whole exercise of making it is aptly rewarding in the end. 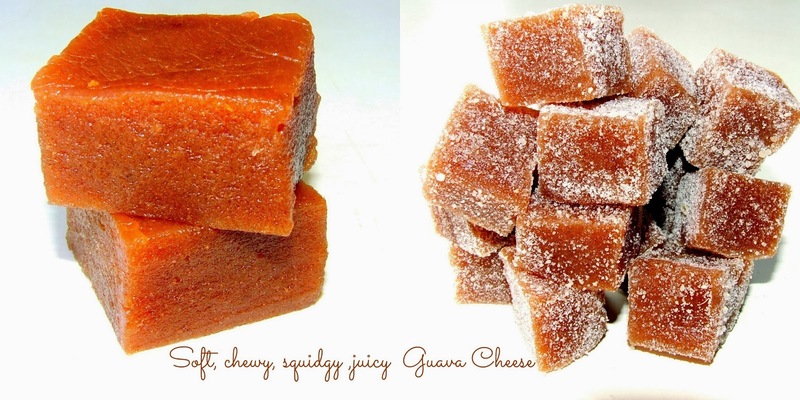 Chewy, squidgy and juicy guava cheese is just out of the world! 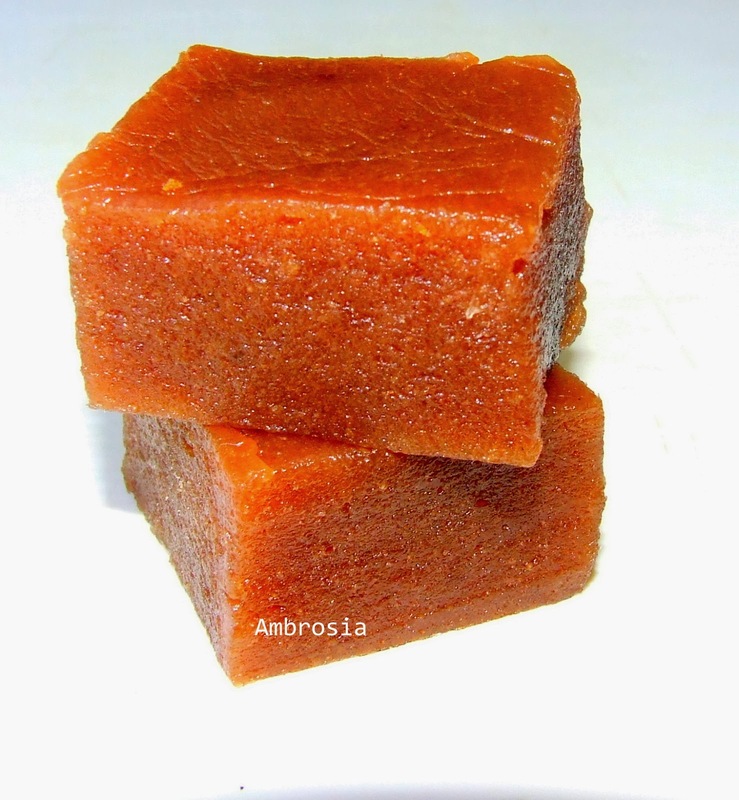 I have made Guava Cheese from the pulp left after making jelly. Wash the guavas, wipe them dry and cut them into small pieces. Cool, mash and strain the pulp using a steel strainer. Discard seeds. For every 1cup of strained pulp add 1 cup of sugar and ¼ teaspoon of lemon juice. Transfer pulp to a thick bottom steel wok. Add lemon juice. Cook on medium flame. The mixture will bubble a lot. Keep stirring. When the mixture thickens and becomes darker in colour and reduces in volume, add butter (1 tablespoon butter for every cup of pulp). Cook till it become thick and you feel an effort in stirring it and the mixture begins to collect in the center like a big ball. Keep a greased ceramic or steel plate ready. Put some mixture in the plate and roll it between thumb and index finger. If it forms a ball, it is done or else cook again till it reaches this stage. Remove from heat, pour the mixture in a greased baking dish and spread it evenly with the ladle. You can also apply oil/butter to your palm and spread it evenly. Let it cool a bit. Cut with a greased knife while it is warm. Let the cheese cool completely. Remove the pieces from the dish. Wrap the pieces in butter paper or cut them into smaller pieces and roll them in fine sugar. What an economical and most delicious way to use all of the fruit with no waste. You and your dad before you are geniuses Namita :). 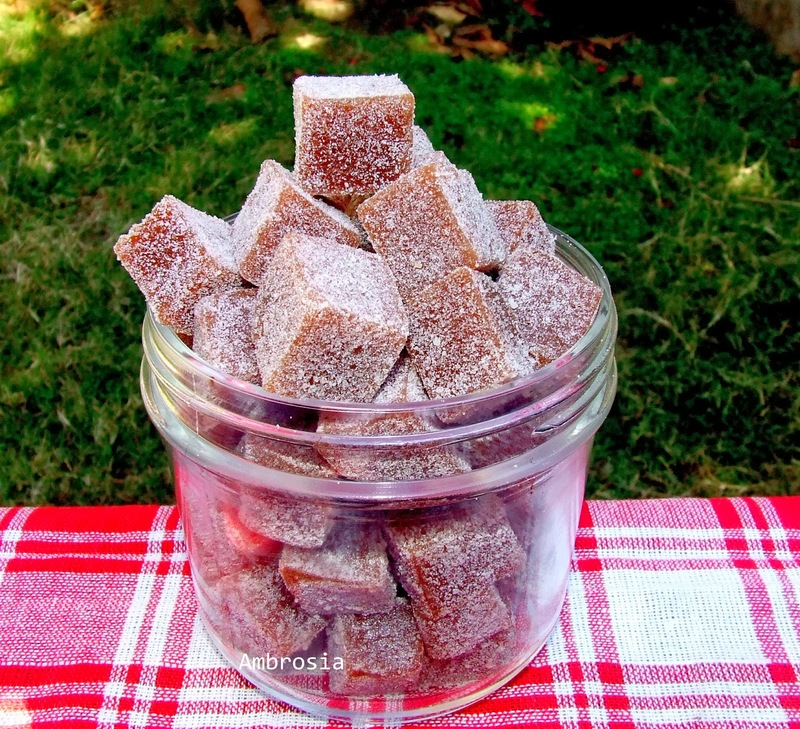 I feel like stealing your guava cheese and the beautiful jars of guava jelly,they are looking so alluring! Lovely dish… and so easy to make these! I love guavas and KDD Harvest’s Guava juice is one of my favourite juices..one quick question, should I use white or pink guavas for this? Hello Diksha, You may use any variety of Guava. Pink or white, both will do. Hello Dawn, I am so happy that your Gauva jelly and cheese came out well. Isn't the cheese yummy? Your cheese has come out perfect. The cheese has a sandy texture. Thanks for visiting my blog and trying out my recipes. 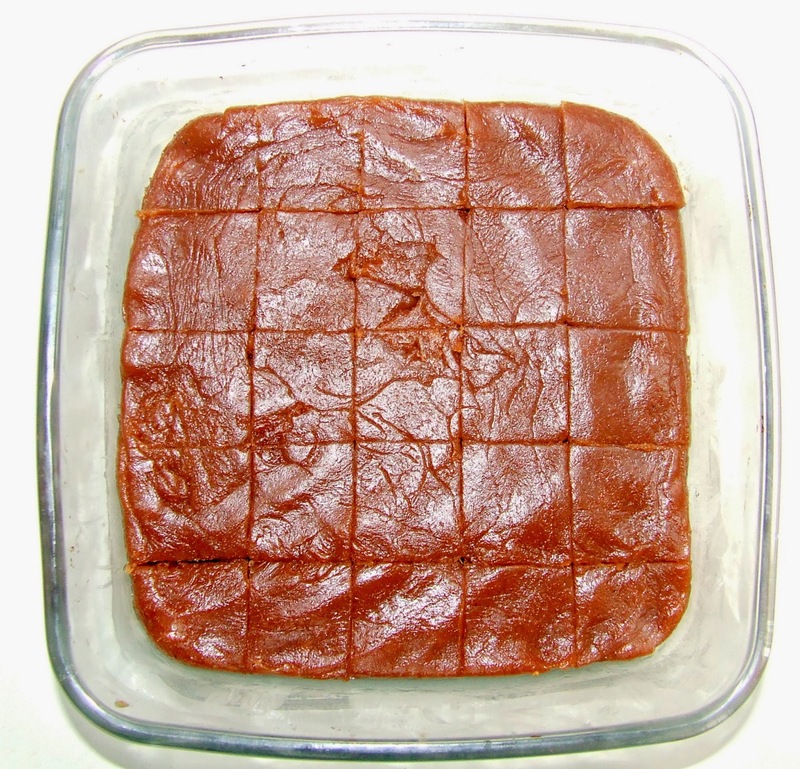 Hi Namita, I made your guava jelly and guava cheese, and everyone at my home just loved it. 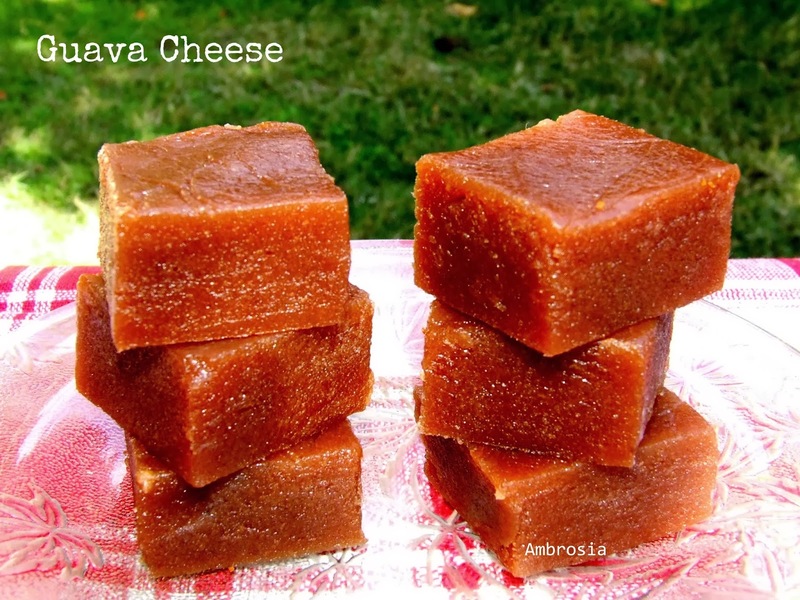 I had never heard of guava cheese before reading in your recipe! I just adore the simplicity in your blog as well as recipes, and love the way how you nicely use all local and seasonal ingredients.